Some of the key indicators that you need roof repair in Orillia, ON include broken or missing shingles and wet spots or stains on your ceiling. When you have a leaky or drafty roof, it can cause a lot of frustration. Water damage can quickly destroy drywall in walls and ceilings, flooring, and your personal possessions, and it can also lead to mold growth inside the walls and floors. Repair after water damage is expensive, which causes financial strain on you and your family. Instead of waiting for an issue like this to strike at your home, give us a call at Slippery Slope Roofing. We provide roof repair, replacement, and installation for customers in Orillia, Ontario, and we have years of experience in the industry. Some of the key indicators that you need roof repair include broken or missing shingles, wet spots or stains on your ceiling (especially after it rains or snows), increased utility bills, and gutters that are full of leaves and other debris. You might also notice that your roof seems to be sagging in certain areas, which is usually caused by heavy layers of shingles from poor repair jobs or rainfall/snow that accumulates on the roof. You might think you can save money by performing your own roof repair, but this is a dangerous job that requires skill and experience. 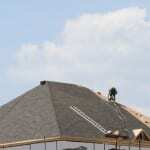 At Slippery Slope Roofing, each of our technicians receives training to complete roof repairs. Our foreman and owner have five decades of combined experience, so we are the right team of professionals for any job. Contact us today to find out whether you need roof repair or replacement, and we can discuss options with you that will fit into your budget.